Yesterday I had an all-day skills workshop, to learn about the occupational therapy specialisation of hand therapy. This basically meant learning how to make splints. The finished lot of splints we had to make is shown in the photo above. There are two resting splints (blue) because I was the “sim-pat” (simulated patient) for the whole class demo for that one as well as having one made for me by my partner. We were paired up and each of the pair took it in turns to be the model/patient and the therapist. The splints in the photo above were made by using a heat pan to soften various materials in order to mould them to my shape, based on patterns provided. The material is a thin piece of “aquaplast” a type of heat-modifiable plastic. We placed the strips into the heat pan, then waited until they had turned clear. We then lifted them out of the pan onto a tea towel nearby, quickly pressed them flat (and peeled them off the tea towel if they stuck), then moulded it to the sim-pat’s finger. The sim-pat, our partner, was holding their hand in a loose circle, with the middle knuckle (PIPJ) slightly curled inwards (flexed). We started behind the knuckle, wrapping the middle of the strip across the sim-pat’s finger then crossed the two sides over underneath the knuckle. We then brought the sides up so that they met on top of the finger again. This involved a bit of fiddling around due to the way the sides met up. Had to make sure it wasn’t too loose or too tight. While wearing it, you should still be able to make a fist (if using it with the crossover underneath the knuckle) or if using it with crossover on top, still be able to flex (bend) the main knuckle (metacarpo-phalangeal joint, MCPJ) and the smallest finger knuckle (distal interphalangeal joint, DIPJ). Need to be able to fully bend the middle knuckle (PIPJ) while wearing it. We scratched out/drew a design on a flat piece of aquaplast based on a tracing of the sim-at’s finger. We then cut it out and put it in the hot water to soften. Afterwards we wrapped it around the sim-pat’s finger, ensuring that it was a snug fit without being too tight. Safe position refers to POSI = Position of Safe Immobilisation. It’s the position that is safest for immobilising a joint and has to do with angles, preventing further injury to the joint and preventing injuries to joints/tissues around the injured joint due to overcompensation. We cut out the pattern after tracing around the person’s hand, using landmarks like the wrist, the bottom thumb joint (carpometacarpal joint, CMCJ) and thumb knuckle (MCPJ). Again, we traced out a design around the person’s hand (and arm), using particular points like the borders of the wrist, the bottom thumb joint (CMCJ) and the thumb knuckle (metacarpophalangeal joint, MCPJ) Then we put it in the water to soften before cutting through the material and moulding it to the skin. It should extend two-thirds of the way down the forearm and leave the fingers and thumb free. Watching out for bony landmarks etc. and remoulding if necessary to avoid them so that the splint does not rub and create pressure points/sores. Applicable to all splints, but noted for this one because I’ve discovered since taking mine home that there’s a pressure point on mine! Should be able to still form a fist. We used a material called “ezeform” to make this. It was the firmest material and was a bit of a nuisance to work with because you had to soften it to cut it, but once cut the pieces would start to stick together. Also didn’t help that as this was the longest splint, you needed a lot of working space. Landmarks used for tracing were the mark of two-thirds down the arm, the wrist, the bottom thumb joint and thumb knuckles as well as palmar creases. Due to the way this splint had to be cut, you needed to mark the inside point near the main thumb knuckle, allow another centimetre inwards then draw a “u-shape” down to the bottom thumb/hand joint (CMCJ) and up to meet the outer line of the tracing around the hand. This created the flap that my thumb curves around in the picture. I have it on good authority that this one is comfortable, as it should be. Not only did it feel comfortable to wear personally, but when I showed it to a few friends they thought it was comfy too. It was an interesting day, but I don’t think I want to make a career out of doing hand therapy (like our facilitator does). It’s a bit too fiddly for me. I’ve had some cooking successes lately. The other night I was pressed for time and needed to cook dinner quickly. I could’ve had a frozen meal (i.e. reheated a serve of leftovers) but I had some chicken thighs in the fridge that needed to be cooked as I’d moved them from the freezer earlier in the week. Voila – I had a piping-hot microwave meal ( 😉 ) ready to eat. Just be careful with step #5. I left the lid off completely as instructed by the online recipe, but that caused too much moisture to escape and the microwave did not like it. 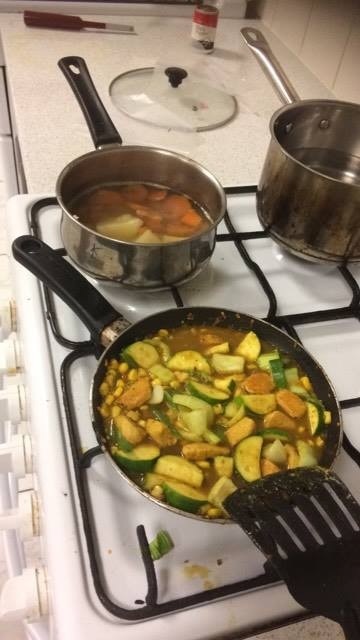 My second success was a few nights after, when, aided only by memory and the help of a googled recipe, I made chicken curry for the first time in my new place, all by myself. So here’s another dish to add to my known repertoire! Stir in garlic, ginger, chilli, curry powder, cumin powder, Moroccan seasoning NB: the curry and cumin powders make this dish, with the Moroccan seasoning providing some extra flavours like hints of paprika and so on. Add as much of the cumin and curry powders as feels right. Add veggies (I added them earlier than the online recipe indicated to because they needed to cook for longer). I also started cooking my potato here in the pot and ended up putting some of the harder veggies (carrots, sweet potato) in with it to reduce cooking time. Once judged that veggies were ready, I combined everything and took it over to the table. It tasted like it should, so yay. Some very good points made here. Reblog from this time last year: Ouch! We’re lucky to have a good health system….. So, it’s been over a year since I dislocated my kneecap. Phew! It was not the most significant personal event of the year, but it was significant enough. I still have to remember to try and do knee exercises (recommended by the physio) to keep the muscles strong. In the end we decided against operating as it wasn’t clear if it’d help more than harm in the long run. It was an experience, that’s for certain, which gave me a new perspective. Thanks again health system, doctors, nurses and other staff. In the weeks afterwards I had to rely on people differently for a while, which was a good thing. It’s also made me slightly more spatial aware than I was, because now I’m somewhat paranoid about my knees banging into things. It still happens occasionally though. Source: Ouch! We’re lucky to have a good health system…..
WordWitch makes a good point here. I tend to use music as a buffer. I’ve started putting on my “soundtracks” playlist when I’m in a “get-stuff-done” mood, at least for uni things. Last year I used a miscellaneous playlist that included most of my music choices, but when you’ve got earphones in your ears (instead of listening via speakers) it’s a bit different. These WT&TT posts will continue, but I have to admit I’m stalled at the moment, writing-wise. I just have too many other demands on my time. Public transport is useful. It can be annoying. It can also be good. We’ve all had (more than) our fair share of having to stand all the way to our destination, just because it’s peak hour and you’re travelling with the peak not against it. (Yes, this is worse on different lines.) Or the times when you’re travelling against/ outside of the peak can actually sit down and relax. When we’re all in the same boat – sorry, carriage – during the peak, a fleeting camaraderie can form, as the standing people shuffle around at each station to let others out and in, then reposition themselves and their belongings so that there’s less chance of knocking into someone as the train moves. Knowing that everyone has to share the same space. I enjoy public transport, most of the time, because it means I’m not having to think too much about getting from A to B. I prefer trains because it feels faster than other options a lot of the time. Trams and buses have their uses, too, but trams seem slow a lot of the time and buses have to deal with traffic. I like the SMART buses when going somewhere new via the road – it means I can be a bit more relaxed about getting there. When you travel on public transport a lot, on particular lines/routes, you get to know them. The amount of time it’s going to take from A to B stopping all stations on a train, for example. Where the nice scenery is (like the bridges over the Merri Creek area near Westgarth and Rushall stations) and where the platforms change sides, if they do. Melbourne’s public transport network is like a giant spiderweb. My main gripe with it is that the web of train lines is like the axle and spokes of a wheel, with the outer rim only provided by buses. Why do we have to go all the way into the city, just to go out again? I like the network because it gets me where I want to go – to see family, my boyfriend, friends; to go to events or do other things. I love warm weather. But the current circumstances are a bit out of the ordinary…. And I’m having to be so very busy in it. WT&TT: Why Have Female Action Stars Lost Their Muscles? Why is that whilst male action stars have only gotten bigger and stronger looking since the 1980s, the female ones seem to have gotten slimmer and weaker looking? Source: Why Have Female Action Stars Lost Their Muscles? 11th March marked 10 months to go until the Melbourne Intervarsity Choral Festival 2018. My reply to that is both yes and no. But to a MIV Committee member, ten months is not very long at all. In my role as Co-Social Secretary, we’re aiming to have a social gathering at least every couple of months, if not sooner. My workload is going to increase as the year goes on and time grows shorter, but it’s not starting at nothing. The next social event is planned for three weeks away! On the 10-months-out date, I spent my morning helping out at a Fundraising BBQ at Bunnings. It was fun, if rather hectic at times. I was the bread-woman – I ensured our tub of bread slices was kept stocked fresh, I took the bread slices (often one in each gloved hand) over to the BBQ-man and held them while he placed the sausage (with or without onion in) then handed the full lot to the customer, who’d already paid our cash-woman. It was sort of fun – we took turns putting our own music through some speakers, leading to more than one occasion of singing along to songs! It was also quite tiring. Not so much the fact that I was on my feet for a good four or so hours doing things, but the social-cognitive stuff was what wore me out more I think. There were times when I was performing the routine described above repetitively without a lull. It was grab bread, listen to order, remember it, turn to BBQ, fill order, turn and locate person, repeat. Sometimes I’d have to multitask if two people wanted one sausage each (so that’s one order per hand) – which could be interesting if one wanted onion and the other didn’t! I got used to repeating, “one with, one without” and “two with” and “two without” and so on. Phew! Another thing that happened on the 11th was the release of the latest MIV Mailout, to coincide with the ten month mark. In it we introduced our musical director! Our Musical Director is Patrick Burns. Here’s his bio, courtesy of this link from the MIV Facebook page – I would have embedded it properly, but it doesn’t seem to like that given there’s a picture with it. “Patrick began his conducting studies whilst completing his under-graduate studies at the Queensland Conservatorium. He is an alumni of the Symphony Australia conductor development program which has seen him participate in workshops across Australia with Orchestra Victoria, the Adelaide Symphony Orchestra, Queensland Symphony Orchestra, and Tasmanian Symphony Orchestra and also in New Zealand with the Auckland Philharmonia under the guidance of Christopher Seaman, Johannes Fritzsch, Sebastian Lang-Lessing and Baldur Brönnimann. From 2010 to 2014 Patrick was the Music Director for the Monash University Choral Society and from 2011 to 2014 was also the Music Director for the Victorian Youth Symphony Orchestra. In 2014, he was made a life member of MonUCS for his contribution and dedication to the choir. He is currently the Chief Conductor for the Ipswich City Orchestra in Queensland and has held the position since 2008. Patrick is also the Music Director for the Melbourne-based artistic collaboration, XL Arts. It’s so exciting. There’s plenty of more cool things to be announced or in the pipeline to happen…why not sign up to the mailing list at miv.org.au to keep informed? RISE are a group of “refugees, survivors and ex-detainees”, who help out refugees in need. Their Melbourne foodbank could use a little love (see attached pics). Also, I’m supporting their call for the Palm Sunday rallies (and other “supportive” spaces to have more direct involvement (e.g. Speakers) from refugees, especially ex-detainees. Not just advocates speaking on behalf of them. Solidarity means putting those affected first, by creating spaces for them to share their stories (for starters)… See this link for more info. Rest is in pictures because reblogging etc. from the Facebook mobile app isn’t the best.